Find the right fit for your file with these three options. Whether you need four, six or eight filing surfaces, these heavy-duty folders will protect and organize documents. 2 inch capacity fasteners inside sturdy 25 pt. covers and 1 inch capacity fasteners on both sides of 17 pt. Kraft dividers. Tyvek reinforced gussets for expansion. 2/5 cut tabs, right of center. 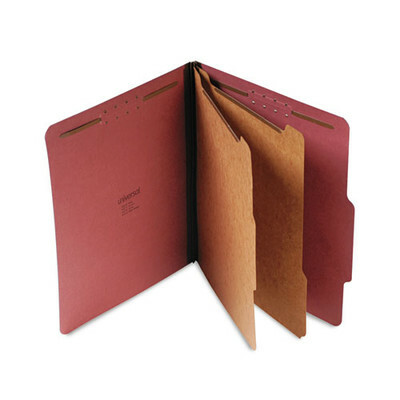 Classification Folder Type: Top Tab; Size: Letter; Number of Sections: 6; Cover Material(s): 25 pt. Pressboard.